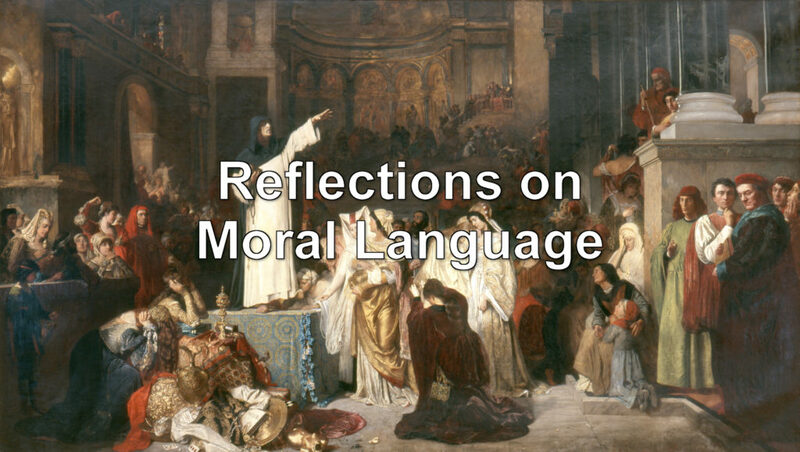 Why do we use moral language? We say, “Stealing is bad” to condition children to feel guilty about stealing. We thus use moral language as a tool for linking social emotions to cultural values. This establishes order and improves cooperation in a society. We say, “You ought not to steal” to shame people for violating social norms. Such judging reinforces social conditioning and maintains order. How effective moral judgments actually are, compared to non-judgmental feedback, is another question. We say, “Thieves are evil” to glorify our own values and preferences. We don’t want to be stolen from, but since others might not care about what we want, we resort to moralizing. Hence, moral language functions as an exalted expression of will, often in the form of a political opinion. Of course, renowned words don’t transform will, value, or opinion into moral truth. We say, “He’s a thief, so he’s unethical” to signal our own moral worth. By shaming other people, we not only reinforce social conditioning and demonstrate that we can recognize shameful behavior; we also imply that we would never act like them. Moral language allows us to signal our virtue and our conformity to group values. We use moral statements to show how loyal we are to a tribe, how devoted we are to a religion, how much empathy we feel for the poor, the powerless, or non-human animals, and how insightful we are about some “higher truth” or “greater justice,” apparently to gain influence and rise in status within our social group. These are the six reasons why people use moral language. If you can think of an additional one, please let me know in the comments below. Morality in terms of effective cooperation, or what I call collective true will, is philosophically grounded in social contract theory. The moral objective thus becomes playing positive-sum games, finding win-win solutions. Morality in terms of probable consequences for conscious beings is philosophically grounded in utilitarianism; the moral objective thus becomes maximizing well-being in the long term.